As the nineteenth-century came to a close, a rush of nostalgia for the “Western Frontier” captivated America. Cowboy filmmaker Charles Camp is one example of this. The films he produced, the “first and only ones ever made of a real Wyoming round-up,” represent some of the first movies seen in Greeley, and he is likely the town’s original filmmaker. 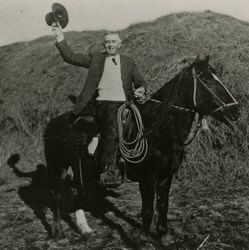 Before he was a pioneering filmmaker, Camp was a pioneer farmer and cattleman, or “cowpuncher.” He came to Greeley from Georgia in 1876, just six years after the town was founded. In fact, Camp’s father-in-law was James Driver, an original Charter Member of Greeley’s Union Colony. Camp fell in love with the western way of life and was sad to see it disappearing. So he made it his goal to save it for future generations. For the next six weeks this rudimentary film crew traveled with a cattle outfit near Laramie. This was by no means an easy endeavor, as early motion picture cameras were unwieldy and the film stock was extremely sensitive. Camp explains that in order to shield the film from the hot summer sun, Stewart changed out the film while “inside the legs of the tripod,” covered with black oil cloth and heavy blankets. While filming, Stewart had to carry the bulky “taking machine” in his arms, and thus the movement of his walking and riding made for what Camp called “Fuzzed” images. According to Camp, the crew “got away with nearly a mile of motion picture negatives.” However, the final product was short and simple, merely showing the everyday happenings of the open range. In the early 1900s, movies such as this were still popular because the novelty of the technology was enough to make them fascinating. When shooting completed, the negatives were taken back to Greeley where Stewart’s brother, George, developed them in the family’s kitchen. George’s daughter, Hazel, recounted that these films were then shown in a tent, likely near present-day Lincoln Park, representing the earliest known movie showing in Greeley. The cowpuncher billed his movies as a “Wild West Show” and claimed that they were so well liked that he was asked to showcase them at the Lewis and Clark Centennial Exposition in Portland, Oregon in 1905. At this expo, Camp says thousands of people saw “the closing drama of the open range” on film and “roared” at scenes of bucking broncos and steer wrestling. Although he had a brief movie career, Charles Camp never stopped trying to preserve the West as he knew it, and continued to write and lecture on the subject until his death in 1939.